The New Year will bring with it much excitement at the Priory. In July we both hope to unveil the Jesse Memorial Window and welcome the start of the National Eisteddfod of Wales. 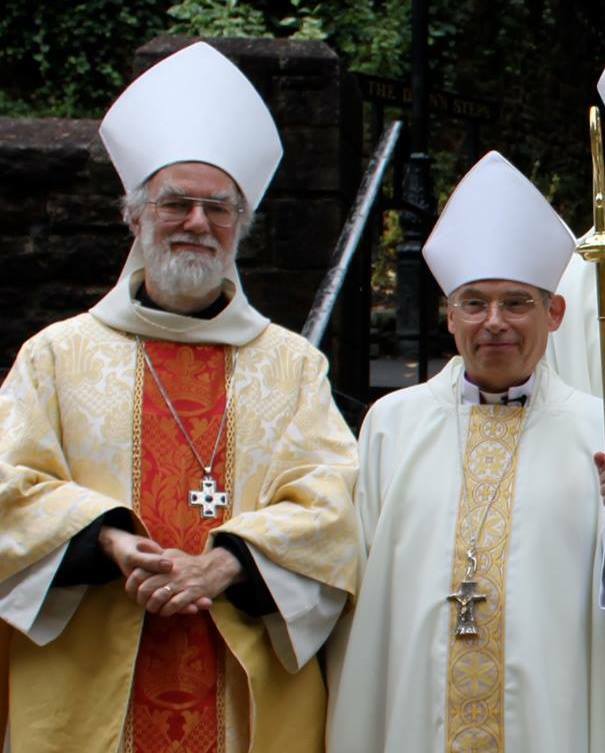 On July 31st – day 1 of the Eisteddfod- Dr Rowan Williams will be the preacher at the main morning Service. Earlier in the year the Anglican churches in the town will host a number of fundraising events to support the National Eisteddfod. Next month (February 6th) we are happy to host “Messiah from scratch” in aid of the Eisteddfod funds. 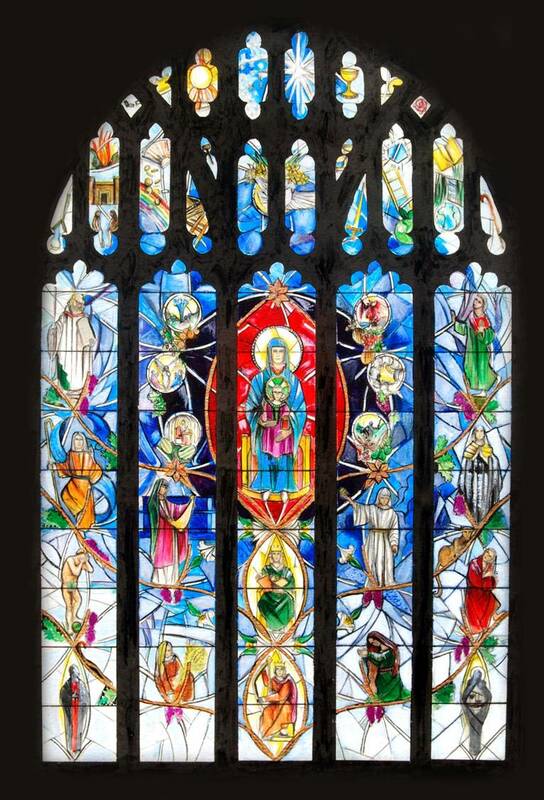 The New Jesse Window designed by the nationally renowned designer Helen Whittaker of Barley Studios is on course to be installed this spring and will be ready to be unveiled in July. Helen Whittaker is Creative Director of the renowned Barley Studios in York. Helen’s stained glass windows can be seen in many churches and cathedrals throughout the country. Helen is an alumni of The Prince of Wales School of Architecture and is a visiting tutor for their School of Traditional Arts. Her MA thesis was on Jesse Trees. Fr Mark said, “The window will be fitting memorial to my predecessor Dean Jeremy Winston who served this parish faithfully for 18 years until he was appointed Dean of Monmouth”. We will join with the nation in giving thanks for HM The Queen’s 90th Birthday with a Concert on April 23rd. The New Year will also see the return of Elvis (aka Keith Davies)to the Priory to raise funds for your sister church, St Peter’s at Llanwenarth Citra. The Priory Church will mark the great Christian Festivals through out the year and we will again be involved in the Abergavenny Food Festival. Canon Mark Soady in his Christmas message reminds us that until the Prince of Peace, Jesus Christ comes again we will not have real peace in the world. ” This year we marked the centenary of the great Battle of Mons that toke so many lives from this corner of the Kingdom, part of the War that was to end all wars, yet here we are at the end 0f 2015 still putting down conflicts. As we sing this Christmastide ‘Away in a Manger, no crib for a bed’… let us remember that history is so tragically repeating itself 2,000 years later as the conflict in Syria has resulted in many babies and their families having to flee their homes and have no where to lay their heads. For remember at the heart of the Christmas story is a refugee family (Mary, Joseph and Baby Jesus) fleeing from a tyrannical ruler (King Herod). This Autumn the Anglican Churches in Abergavenny through Embrace the Middle East purchased 67 mattresses for those refugees currently living in Lebanon – a small drop in the ocean of the 1.1 million Syrian refugees now in that country. So as we give thanks for the coming of Christ 2,000 years ago let us pray he will come again and then all people will know true peace in their lives. Meanwhile as we celebrate this Christmas let us commit to doing our little bit to bring peace where there is hatred and shine a ray of happiness in to the dark corners of the world. It has been a great week of build-up to Christmas at the Priory, culminating in the draw for our Christmas Raffle at the Food Fest. The week started with a busy Tuesday. During the afternoon the Holywell Community hosted OAPs to Tea at the Vicarage. Then it was Cantref School’s Christingle – always a great event and a packed house. Later that evening we had our Volunteers Christmas Party at the Tithe Barn. Oh and we didn’t mention planting a Yew Tree for the Agincourt 600 Trail. We started our tour of the Pubs with Beer & Carols Evening at the Swan Hotel on Wednesday. Having earlier in the day packed up presents for Teenagers-in-need. Then we turned our minds to the Winter Food Festival:Prep on Friday and Saturday …and the event itself on Sunday, culminating with Carols, Mince Pies and Mulled Wine in our Outer Courtyard. St Mary’s Priory Church Abergavenny has taken delivery of a yew tree provided by the Woodland Trust and Agincourt 600 to commemorate the 600th anniversary of the battle of Agincourt when the Welsh archers and men at arms joined Henry V’s troops at this famous battle. The Abbot’s Garden was once used by the monks living in St Mary’s Priory to grow vegetables and herbs for cooking and in medicines. In medieval times an enclosed garden was a sacred area and in paintings of the Blessed Virgin Mary she is represented holding Lilies. Many Welsh names of flowers and plants are named after her.